Beyond A Year in Space introduces viewers to the next generation of astronauts training to leave Earth’s orbit and travel into deep space. The first installment of A Year in Space, which tracks Scott Kelly’s mission from training and launch, through his 12 months aboard the International Space Station, right up through his descent and landing is scheduled to air on PBS on March 2, timed within a day of Scott’s planned return to Earth. Despite the technological “comforts” of the ISS, a year in space – the longest space mission in American history – has been described as the epitome of extreme, with extraordinarily high physical stakes. 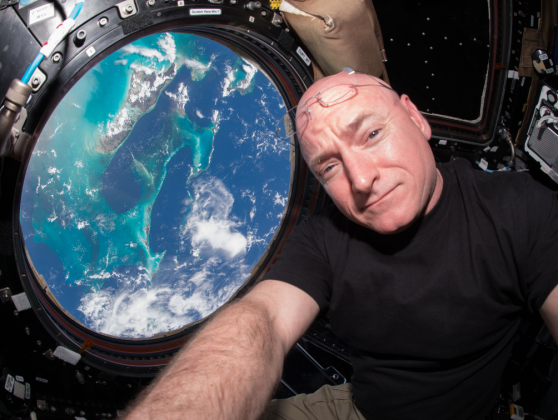 Following Scott in space and his identical twin Mark Kelly at home on Earth, the specials will tell the story of what it takes, mentally and physically, to spend a year in space and then, using what NASA has learned from the Kelly brothers, what it means for humanity as we journey to Mars and beyond. In the Kelly brothers, the National Aeronautics and Space Administration (NASA) has a near-perfect, two-person sample group for biomedical research. NASA is closely tracking Scott’s physical and emotional changes, and his biological functions, down to the molecular level while he is in orbit. The agency hopes to identify precisely what changes happened to Scott as a result of 12 months in space by comparing him to his identical twin, Mark, on Earth. What NASA learns about how Scott withstands the physical and psychological difficulties will provide scientists with key data to develop methods of overcoming the challenges of human interplanetary travel. Viewers will witness the rigors of Scott’s training to live in space for an entire year and will get to know his family and their dreams, stresses, fears and loves. Interwoven into the series’ compelling personal story, A Year in Space will also delve into the broader historical context of the mission, including the history of space exploration, the political background of the Russian-US relationship – Scott’s compatriot at the start of the mission is Russian astronaut Mikhail Korniyenk – and the science/engineering conundrums posed by interplanetary space travel. On March 2nd, 2016, Scott Kelly returned to earth from the International Space Station after spending a record-breaking year in outer space. Now, scientists are studying Scott to answer the pressing questions: How did space change him? And how can we keep future astronauts safe on long journeys to deep space and beyond? Jessica Meir & Victor Glover are among the latest class of astronauts, who may be the first people to travel beyond the moon and possibly to Mars. The astronauts of Class 21 will face a new set of challenges, completely different from the trials the Mercury 7 faced in the midst of the space race. Isolation on long-duration space flights, extreme amounts of radiation in deep space, and the unknown long-term effects of zero gravity on the human body; these are the unknown dangers facing space-bound humans. Scott’s twin brother Mark is a retired astronaut, and the siblings present a unique opportunity to NASA. By analyzing both brothers over the course of Scott’s Year in Space and beyond, NASA hopes to gain its fullest understanding yet of the effects of space flight on the human body. These advancements will make it possible to send people like Jessica and Victor to Mars, and know that they’ll be healthy when they return. Beyond A Year in Space traces the steps of human space flight from the first animals sent into space to Scott Kelly’s historic flight, and into the future of humanity finding its place in the cosmos.